Tai Chi and Qi Gong lessons teach sequences of slow, coordinated and elegant movements which are used as a focus for meditation and mindfulness. The aim is to achieve a whole body connection, integrating the physical movements with the breathe aiming for a singularity of mind and body. Ranging from simple to challenging these profound exercises are thoroughly worthwhile to learn and can have a remarkably positive effect on the body’s health and mind. 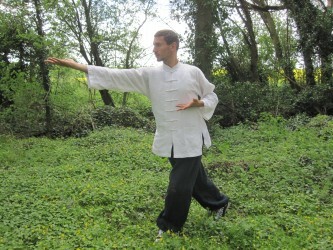 Nick teaches private lessons in Tai Chi and Qi Gong exercises for individuals and groups for beginners or more advanced practitioners. He is also available to teach at workshops, seminars and retreats. Please contact Nick by phone or email to find out more and to book a lesson or workshop. 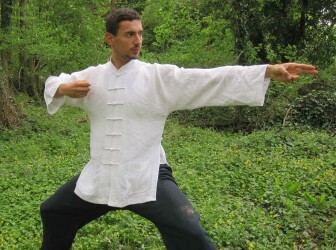 Information about our Tai Chi, Qi Gong and Dao Yin Exercise Syllabus can be found below. Qi Gong literally translates as ‘energy work’ but is more accurately described as ‘the skill of working with energy’. 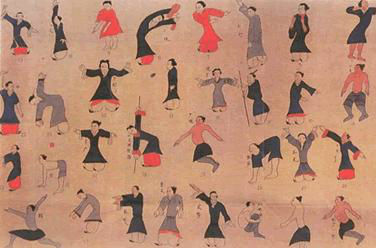 It is a meditative practice of slow graceful movements originating from the Daoist and Buddhist traditions of China. Records of Qi Gong practice date back to roughly 5000 years where the practice was known as Dao Yin (opening and guiding exercises). The Qi Gong exercises that we see today are a more modern creation which one the less have their roots in ancient Dao Yin practices. Tai Chi Ch’uan was originally developed as a form of martial art although it is now largely taught and used for health and meditation. The Tai Chi form is a beautiful sequence of exercises, performed slowly and mindfully with a focus on coordination, balance, breathe and relaxation. The ultimate aim of Tai Chi is to achieve a complete integration of the physical movements with the breathe and the mind into one synchronistic state of moving meditation. There is a great emphasis placed on correct posture and structural alignment in order to make the movements more efficient. This helps keep the joints open in order to maximise the flow of blood throughout the body and keep the major nerve pathways free and un-impinged. These exercises provide the basic foundations for all Qi Gong practice in addition to being effective healthcare exercises in their own right. 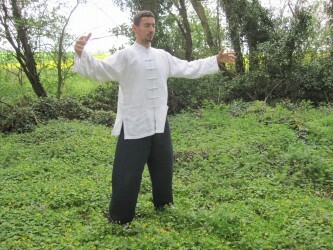 The set is designed to teach the practitioner the basic structural alignments of Qigong. Emphasis is placed on learning how to create a standing position in harmony with gravity. The weight of the body should naturally transfer down through the skeleton with minimal tension holding it in place. This in itself can have a great therapeutic effect on correcting body misalignments and postural problems. The set of 8 exercises circulates Qi through every one of the 12 organ meridians in sequence which helps to regulate all the internal organs, nourish body’s Qi and calm the mind. It is recommended that all beginners start their practice with some of these exercises before moving onto more specific or advanced practices. These Qigong exercises work with the 8 congenital meridians of the body as opposed to the Ji Ben Qigong which focus primarily on the 12 acquired organ meridians. As a result they have a stronger affect on the deeper aspects of the body’s nervous system and energy system. The exercises can help access more fundamental long term energetic blockages within the practitioner. 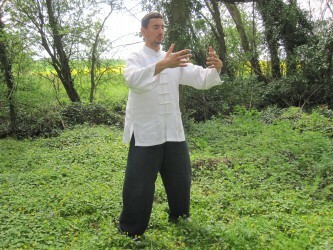 Whereas Ji Ben Qigong teaches structure and alignment Hun Yuan Qigong emphasises softness and introspection. 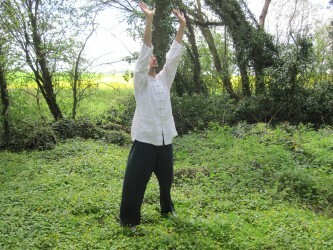 The Hun Yuan exercises also begin to open the energetic centers known as the Three Dan Tien (Elixir Fields). Whereas Qiqong focuses more on regulating and nourishing the body Dao Yin exercises are most effective at opening the joints to help move Qi and Blood throughout the body. The Dao Yin exercises are generally stronger and more physical than Qigong exercises sitting half way between Qigong practice and Yoga. These Dao Yin exercises employ more complex body mechanics than the basic Qigong sets. They emphasise the coiling and opening of the spine in order to open the vertebral spaces. The twisting movements are very aesthetically beautiful and are designed to mirror the movements of a Dragon. The majority of the nerves in the body originate from these spaces and release pressure on these nerves can have profound physiological benefits for the practitioner. 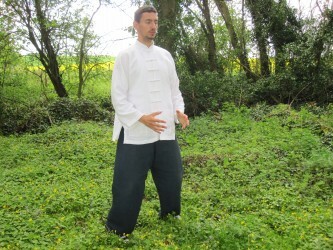 It is recommended that a practitioner already has a good grounding in at least two of the basic Qigong sets before studying the Dragon Dao Yin exercises.